I want to honeymoon in Cabo but we are on a budget, I was thinking all inclusive maybe? Any suggestions on a place that would be beautiful, romantic, and inexpensive? There’s no reason that you should have to break the bank to have a beautiful honeymoon in Cabo. All inclusive resorts can be a great way to go, especially if you book your airfare through Travelocity , Expedia , etc. They often have discounted packages that can include your airfare, airport transportation, hotel and all your food and drinks. Beware that many of the all inclusive resorts run to full capacity during high season, so you will not be totally isolated. I would recommend either one of the Rius – Riu Palace Cabo San Lucas All Inclusive or Riu Santa Fe All Inclusive . The Palace is the more expensive one. Both are really nice. I’ve staying in many Rius and never been disappointed. They do a good job of providing a luxurious feeling even when at high capacity. Also check out the Pueblo Bonito Rose; it’s centrally located on Medano Beach. Pueblo Bonito is an Mexican line of high quality resorts and they have a few in Cabo. If you can afford to splurge a little more, their Pacifica Resort has gone All Inclusive. It’s secluded and totally romantic – perfect for a honeymoon. Also, there are a few all inclusive resorts in San Jose del Cabo that you might look into, however I would recommend staying in Cabo San Lucas for transportation ease. The Cabo Surf Hotel is a wonderful, romantic, small boutique hotel that is worth looking into even though it is not all inclusive. Oh and definitely make sure to call ahead and tell the hotel that it is your honeymoon. 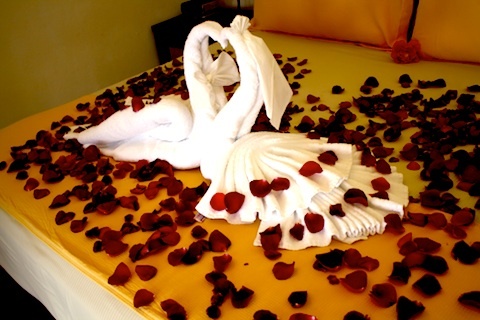 Most hotels and resorts in Cabo will do something special for you such as a bottle of champagne or rose petals on the bed. Be sure to send us pictures of your beautiful honeymoon! Want your question answered by All About Cabo? Ask an Expert!